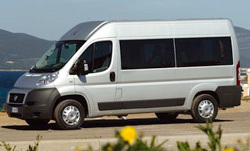 The Fiat Ducato Comfort-Matic has been hailed as the best motorhome base vehicle available in the Which Motorcaravan magazine 2010 awards. While the award judges liked the Ducato in all its forms, it was the Comfort-Matic-equipped models that impressed them the most and they also credited Fiat for its “superb” European asssistance package. The Which Motorcaravan team tested a Bürstner Viseo A-class based on the Ducato throughout the summer last year and took it on a long-haul trip to Biarritz. The Editor wrote: ‘All we had to do now was cover 450 miles. Easy, and indeed peasy. After all, with the air-con on, the cruise control on, and driver relaxed behind the big Bürstner’s panoramic windscreen, our Viseo has always been a joy to control. Announcing the Ducato as winner of its Base Vehicle award, the magazine wrote: “Even after 5000 miles in six short months we never had cause to doubt our enthusiasm for the top-spec chassis. It made manoeuvring a big ‘van less stressful (even onto leveling wedges) and long journeys a doddle. They offer this suggestion too – if you can afford it, go for the luxury of Fiat’s robotised gearbox – it turns an already competent all-round package into something special. The judges said: “The new 2-litre engines provide more power for top-line versions – 140 or 180bhp. The flagship 180bhp Biturbo is especially impressive. Volkswagen say it’s half as loud as the old model, and up to 20 per cent more frugal.